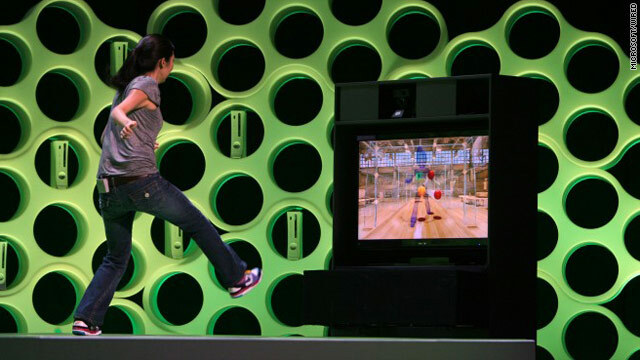 Microsoft says its motion-controlled Project Natal gaming system will be on sale by the 2010 holidays. (Wired) -- While it's not likely that any new gaming consoles will be released in 2010, there's plenty of new hardware that will change the way we play. 2010 is the year that everyone catches up to Wii: Both Microsoft and Sony will introduce their own unique takes on motion controllers. Meanwhile, Nintendo will attempt to move things in a different direction with the Wii Vitality Sensor. But perhaps the biggest game-changer could come from Apple. And in a post-iPhone world, that doesn't sound so far-fetched. Here are Wired.com's picks of the gaming gadgets that will come to define the next 12 months. This revolutionary interface for Xbox 360 ditches joysticks for an array of cameras and microphones that track your movements, recognize your face and respond to your voice. Microsoft says it'll be available this holiday season. Wired.com got some hands-on (off?) time with Project Natal at E3 2009, and we can attest that it genuinely works. Natal really does track minute movements of your body, allowing you to swing your arms to whack things onscreen or grip an imaginary steering wheel to drive a virtual car. Even just fiddling around with simple prototype proof-of-concept software generated the sort of excitement and wonder that Wii Sports did the first time I played it. Nintendo is known for innovative accessories, but the Vitality Sensor is old tech: A similar device was released in Japan for the Nintendo 64 well over a decade ago. Since the notion of a videogame controller that reads your pulse from your fingertip isn't new, Nintendo must come up with interesting pieces of software if it's going to sell this thing to the Wii Fit crowd. The company says the pulse-monitoring feature could be used for a game that helps you relax, but hasn't actually shown any such thing yet. Nintendo's president recently named the Vitality Sensor one of the company's big products for 2010, saying that software would be announced in July. Our hearts aren't racing just yet. To make a long story short, Sony's new device is like a Wiimote that can be tracked by an EyeToy camera. The PlayStation 3 will know where the controller is moving, but it will also be able to (for example) project your image onto the TV screen, then replace the controller in your hand with a virtual sword. The combination of motion sensing and position tracking should make Sony's controller much more accurate than Nintendo's. But we haven't seen much more than tech demos yet, even though Sony says the motion controller will launch in the spring. "Ape Escape" and "Resident Evil" titles that use the controller are in the works. The iPhone was a game-changer for mobile gaming. Since the phone debuted in 2007, the App Store has been deluged with games, more than a few of which are awesome. Apple's rumored tablet, a multimedia touchscreen device meant to compete with (read: crush) similar but lesser-featured gadgets like Nook and Kindle, can only mean interesting things for games. Rumors suggest that Apple's machine will be less a computer and more an overgrown iPhone. So you probably won't be playing World of Warcraft on the thing  more likely, you'll be playing stuff like Defense Grid on a big, roomy screen. One potential downside is that developers might not have the money, resources or motivation to release upgrades of their iPhone games to suit the tablet's larger screen. What if the game boom on the iPhone was a one-time deal? While it's certainly possible that either Nintendo or Sony could release a new handheld gaming platform this Christmas, we know for sure that another version of the DSi is on the way first. Already available in Japan, the DSi XL is scheduled to be released in the first quarter of 2010 in the United States and Europe. You mean we all have to buy a fourth Nintendo DS? Yes, even though the only difference is that the DSi XL has giant screens. Portability takes a backseat to visibility in this new model  the 4.2-inch screens make your games pop with big, bold images, but make the unit itself much larger. You might not think you want this, but when you experience how much easier it is to play with bigger screens, you'll probably be hooked.